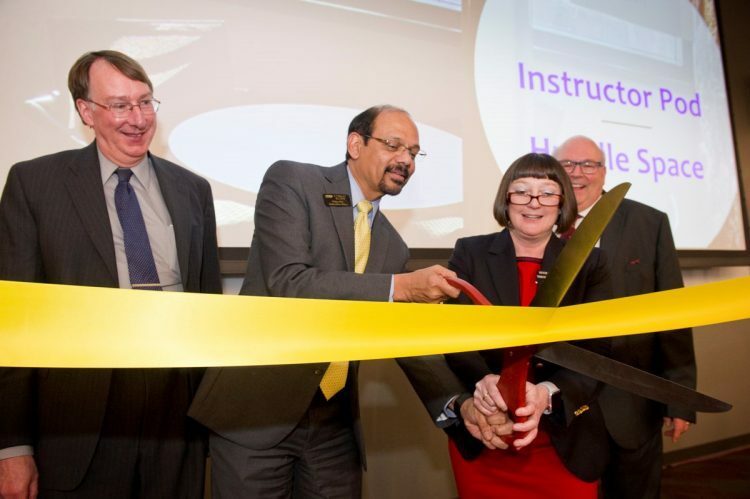 Provost Tom Christensen; Chancellor Venkat Reddy; Valerie Martin Conley, dean of the College of Education; and Mark Malone, chair of the Department of Teaching and Learning; cut the ribbon in the new lecture hall Feb. 21. The College of Education’s Department of Teaching and Learning celebrated the move into renovated facilities at University Hall with a ribbon-cutting ceremony and tours Feb. 21. 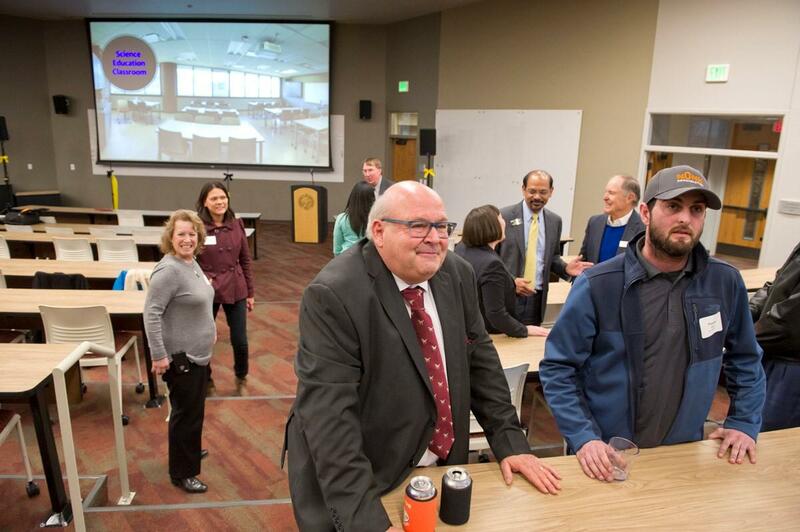 The renovations include a new lecture hall, two classrooms, offices, a student resource center and multiple breakout, work spaces, student lounges, conference and seminar rooms. The new lecture hall took the place of the old Theatreworks performance space and incorporated the existing stone features of the room. 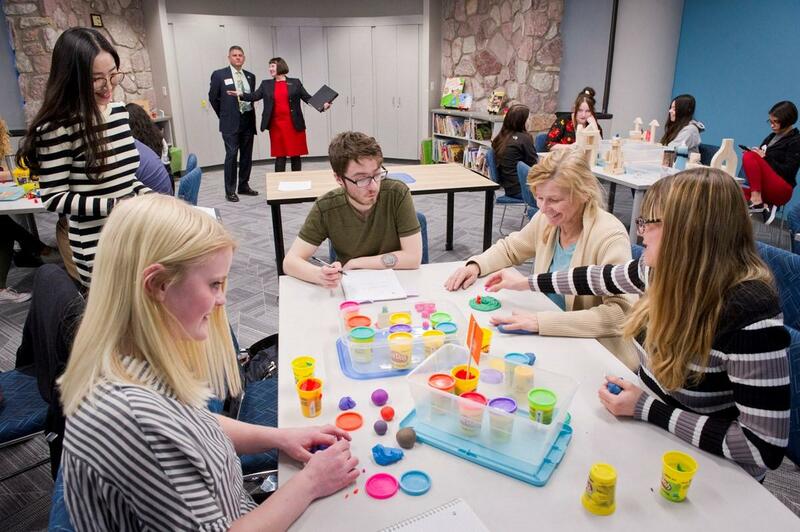 On the second floor, a new science education classroom includes flexibility and storage for students to learn the best methods for teaching science subjects to a wide range of ages. A second classroom was designed to also fully accommodate elementary, early childhood and special education courses. 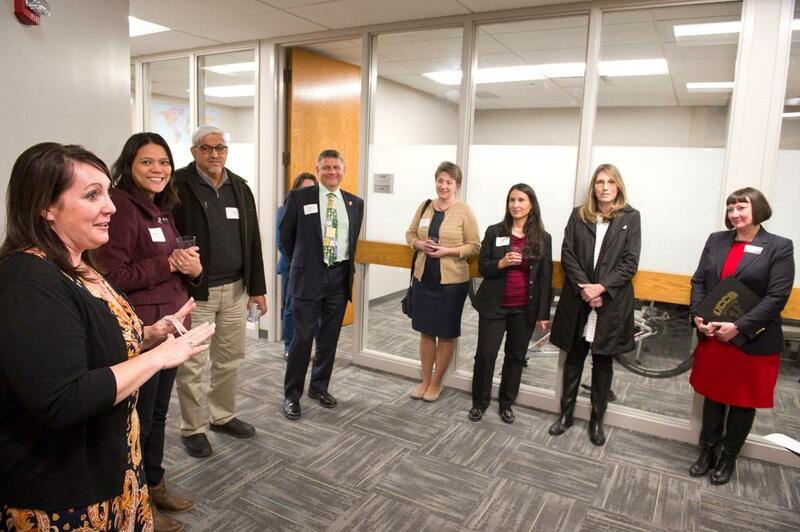 “We are especially excited to have spaces that mirror the educational settings our teacher candidates will encounter in the field,” said Valerie Martin Conley, dean of the College of Education. Overall enrollment in the College of Education has grown by 82 percent since 2013 to 862 graduate and undergraduate students. In the last six years, the college has added new degree programs in inclusive early childhood education and inclusive elementary education. A new degree bachelor’s program in human services will start in fall 2019. The renovations of the two floors was done after the space was vacated when Theatreworks and the Visual and Performing Arts Department moved into the Ent Center for the Arts in January 2018. The new general classroom in University Hall. Tour stops near faculty offices in the University Hall. Mark Malone (left), department chair of Teaching and Learning, and Thomas Vinci of Nunn Construction, in the new lecture hall. 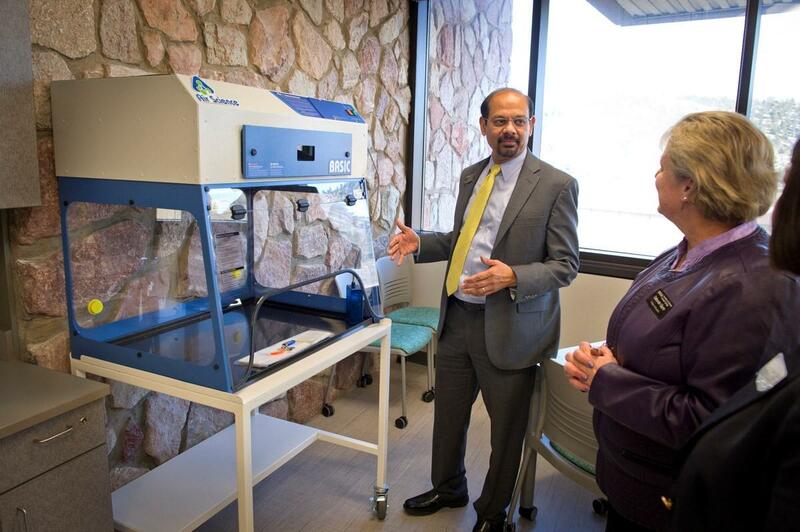 Chancelllor Reddy and Deborah Glynn, executive assistant to the dean, with new equipment in the science education classroom.